716 pages | 118 Color Illus. For use as a text in foundations generalist social policy courses, either at the baccalaureate or master’s level, this book examines the process of defining need, analyzing social policy, and developing new policy. A clear philosophical base and a common theoretical framework underlie the discussion of each component of the policy process. Each chapter builds on the knowledge foundation provided in previous chapters to equip students with skills necessary for effective policy practice. 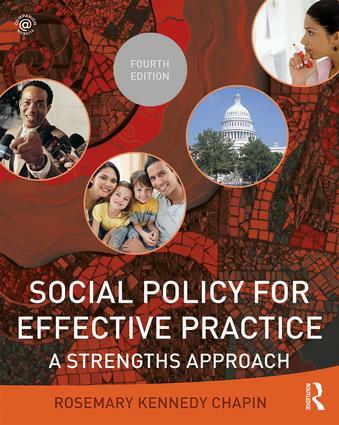 Four themes are interwoven throughout the book: the importance of thinking critically about social policy, the benefits of using the strengths perspective in policy analysis and development, the critical role social policy plays in all areas of practice, and the absolute responsibility of every social worker to engage in policy practice. Rosemary Kennedy Chapin, Dr., is an award-winning teacher and researcher, possessing extensive program development experience in the social policy arena. After receiving her PhD, she worked as a Research/Policy Analyst for the Minnesota Department of Human Services, where she was involved in crafting numerous longterm care reform initiatives. In 1989, she joined the faculty at the University of Kansas, where she established and now directs the Office of Aging and Long Term Care (OALTC), which was created to improve social service practice and policy for older adults, particularly low-income elders. Her social policy research and strengthsbased training initiatives can be viewed at www.oaltc.ku.edu. Dr. Chapin has been recognized at both the state and the federal level for her social policy research and advocacy..She recently won the prestigious Steeples Award for her policy practice work on behalf of older adults. In addition to numerous articles and book chapters on social policy, she has also co-authored a text and various book chapters on the use of the strengths approach in social work practice with older adults. She teaches social policy and social work and aging courses at the University of Kansas. Dr. Chapin and her husband have three children and live in Lawrence, Kansas.